And even some impressive plays. I might have to go so far as to say they almost look like a real baseball team this weekend. Because they have sure come a long way this week. They were quick on the bat (most kids only taking 1 or 2 pitches before getting a hit). And they made plays on the field. Stopping the ball. Throwing the ball. Tagging the runner. So much so that we ended every inning with 3 outs vs. the 5 run rule and barely let the other team make it through their entire line-up over the course of the entire game. Our team on the other hand ended every single inning with a 5 run rule and came just 3 people short of making it through our entire line up 3 times. But those aren't the things I will remember most about these games. I will remember Connor akwardly carrying his bat and trying to run with it to 1st base after getting a hit. And me cheering him on, shouting "RUN! !, RUN! !, RUN!!! !, and laughing so hard as he akwardly tried to carry his bat, hold his helmet and run at the same time. So much so that I didn't even think to snap a single picture of it. You will have to take my word for it - it was priceless. I will remember the too big helmets that bobbed up and down as they ran and occassionaly had to be held on to. 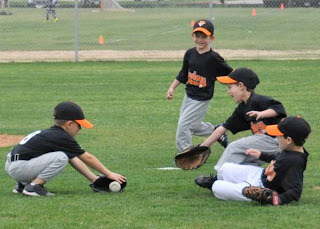 I will also remember Connor getting to 1st base only to find it already occupied by another teammate who forgot to run. I will remember mob fielding (I think that's technically the SS, wnd baseman, pitcher and right fielder). And skippy here taking his time to get to the base. Their smiles. And the fact that I smiled so big, and so much that my cheeks hurt afterwards. That's what I will remember most about this season.